The National Restaurant Association Educational Foundation (NRAEF) website, www.chooserestaurants.org, has added features to make it easier to administer exams and the ProStart program. There is now an online application to register for access to the site, including exam scheduling and program-specific information. This process eliminates frustrations with accessing and administering exams. The first step is to register online by clicking here. Fill out the form provided. Click SAVE in the bottom right hand corner. After you complete all of the steps, NRA will email you the confirmed User ID and Password. Under the Schedule Class tab, choose CREATE Class beside the textbook you want to set up an exam for. Accept the Proctor Agreement – During this step you may print off the Exam Administration Handbook. This is recommended if you do not have an updated copy. If your Organization is not an option in the Organization box, click on the word Organization. The system will then do a search for your organization. Continue the process to include entering the exam date and location. Print off the Exam Information Form and the Exams. You must return the Exam Information Form when you return the scantrons. To order scantrons, please contact Nick Ramos at nick.ramos@pearson.com. ProStart students are eligible to earn the National ProStart Certificate of Achievement (COA). This Certificate gives students access to national and statewide articulation agreements and scholarship opportunities. Student must take and pass the Year One and Year Two ProStart Exams. To order exams and/or scantrons, please see Administering ProStart Exams (above). Student must work at least 400 hours in the foodservice industry. If students do not have jobs in the industry all 400 of the required work hours may be signed off by the instructors. If the instructor signs off on any hours, the hours signed off on by the instructor must be earned outside of the regular class time. Practicing for competition or attending a workshop does not count toward the required work hours. Students must register at the ProStart website. Students need to use their legal name each time they take a ProStart exam. This enables NRAEF to locate their record easily. Once a student has passed either the Level One or Level Two ProStart exam (Foundations), their COA process officially begins. The student may log in and enter Work Experience Hours. Students must submit a signed copy of the Work Experience Checklist to the teacher. 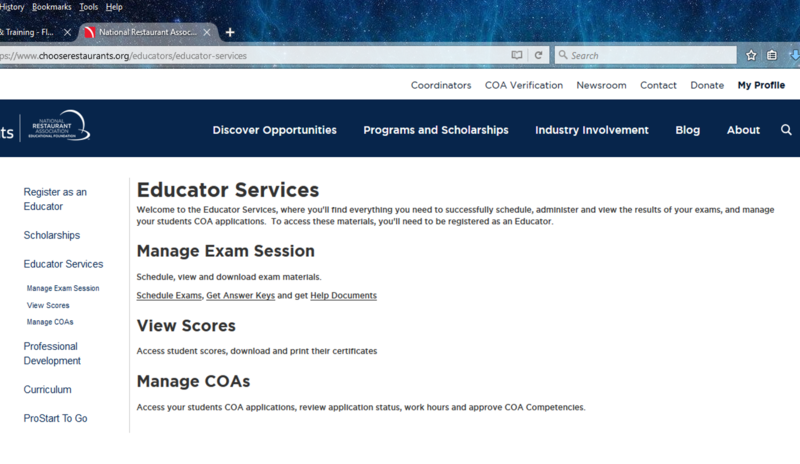 COA applications are connected to the teacher who administered the student’s most recent exam. Teachers must examine and confirm work experience documentation. If the student has completed work hours under your supervision, you may use THIS FORM to log their hours, or you may design your own. Teachers must examine and confirm the student’s Work Experience Checklist to make sure 52 out or 75 competencies were reached. Teachers then send all documentat ion to Amy Parker–you may scan and email, fax or mail. 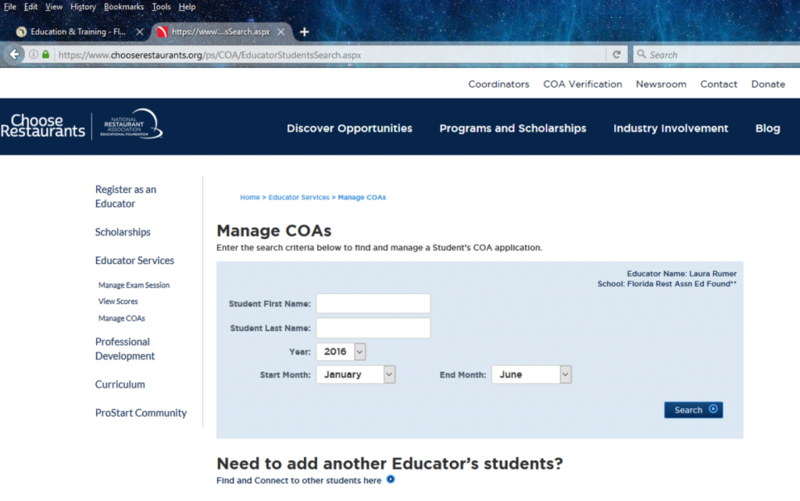 The FRLAEF will be notified whenever an educator has approved a COA application. After reviewing and confirming the documentation, the FRLAEF may approve a student’s COA application. Once the application is approved a certificate will be awarded and mailed directly to the student using the address that student has in his/her profile. Students will receive a reminder to check the address in their profile before the COA is mailed. CLICK HERE for PowerPoint instructions. CLICK HERE for instructions in pdf format. 1. The student should log in to the NRAEF website and go to Track COA Progress (in the drop-down menu under “Students”). 2. From that page, if there is a missing exam score, the students should return to the Student tab and then select “Exams” from the dropdown menu. 3. The student should then select “Check My Scores”. 4. On the next page the student can enter the exam session number in that box and then click “Find My Record”. The page will reload and there will be a message confirming that the exam record has been tied to their profiles. NOTE: If the student’s name in the exam record(s) and the profile created during registration does not match exactly, (i.e. if the student took the exam as Jim Smith and registered as Jimmy Smith), the Service Center will need to facilitate the merge.